Thankfully, it’s finally warming up and I’m getting so excited for summer. With summer comes swimsuit season which can have some of us feeling less than great about showcasing our changing bodies that we’re just getting used to ourselves. Mommas, please remember that all bodies are beautiful! I’ve found that finding a cute, good quality suit, that fits your changing shape can really help boost your confidence. One of my most popular blog posts is my pregnancy & nursing friendly swimsuits post. 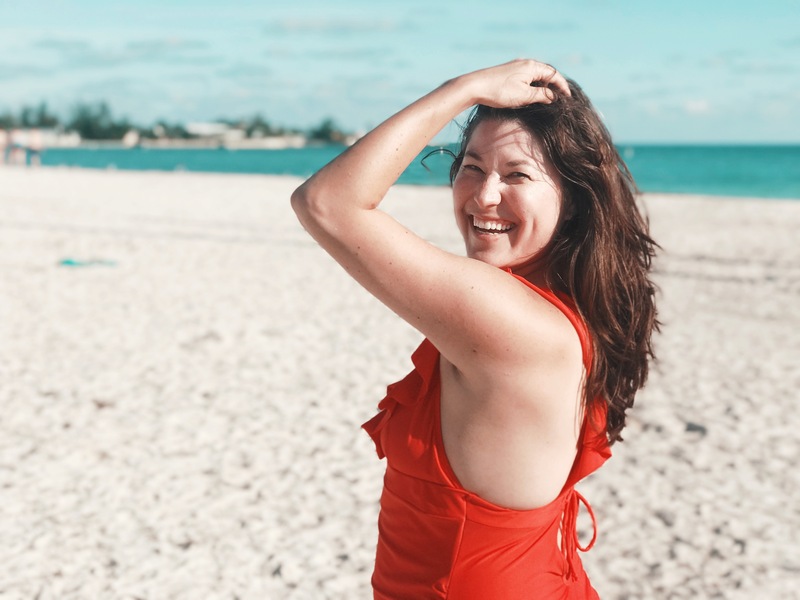 Since that post there’s been some awesome new swimsuit brands that have launched and I wanted to update you ladies on the cutest suits that I’m coveting this year! These suits should help you feel confident as you struggle through the sand with a 30lb toddler on one hip and 30lbs of beach crap in the other. Waddle, Waddle, Sashay, Ladies! **None of these are sponsored or affiliated links. Just my honest opinion. Lime Ricki – Modest Swimwear (and now clothing) line started by three sisters. They are an all women company, they don’t airbrush or photoshop their models and they are inclusive in their sizing and diversity. So many of the instagram shops I follow are all white and it drives me crazy. I really appreciate and notice their awareness that size and color representation matter. Also, all their swimsuits are made in the USA and they give back a portion of their sales to Charity: Water. Olivia & Ocean – Mompreneur founded Mommy and Me Swimwear line. All suits made in Los Angeles by seamstresses paid a fair wage. Portion of profit is donated to water.org. Hermoza – This brand just launched by two moms that wanted quality, affordable swimwear with “timeless silhouettes.” These suits don’t look maternity or nursing friendly but do look great for the mom bod. Raising Wild – Run by two mompreneurs that are also sisters. I appreciate the different body types and diversity of models in their photos. Kingdom and State – I love their suits. Fun prints, romantic and retro styles. They have nursing friendly zipper options as well! Andies Swim – I love their one piece swimsuits that look classic and stunning while being age appropriate. Seea – I’m obsessed with these retro looking suits – one piece to surf suits for the active mama. They have littles sizes too. Albion Fit – I featured this brand in my original post from last year. This small family run shop launched in Utah and has grown thanks to their cute prints and flattering styles. They started with fitness wear and have expanded to swimwear. All suits are cute and modest with hight waist bottoms, or fun prints on one-pieces. Suits are maternity friendly and I love the zipper one pieces for nursing! While looking through their instagram for a photo I did wish I saw a little more inclusivity in body type and color on their page. Kortni Jeane – This brand I also mentioned in my previous post. Female entrepreneur small shop that has really gained main stream traction. Her suits have bright mix and match prints for moms, littles and dads! Suits are maternity, nursing and postpartum body friendly. Did I miss one of your faves? Let me know in the comments below! I hope you find a suit that makes you feel as beautiful as you already are! !